Barrow has the highest number of drugs-related deaths in the county at 9.9 per 100,000 citizens. People in the area are more likely to die a drugs-related death than those in Manchester, Liverpool or Lancaster. Active Recovery Community (ARC) Barrow is tackling this issue with the aim of reducing the long-standing drug problem locally. 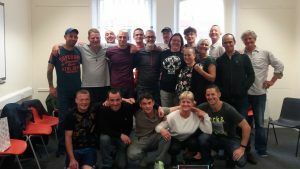 The self-help group received £600 from the Barrow in Furness Grassroots Fund to organise activities and meetings for people dealing with substance misuse and domestic violence issues, engaging members in all activities and pro-actively looking for the best approach to abstinent recovery. Give – helping others to help themselves. A 27 year old man from Ormsgill had been using substances since he was 13. Through talking to ARC along with his partner, he was able to get help, and made contact with two volunteers. ARC Barrow was formed in 2014 by a group of recovering alcoholics and addicts, all with various different skill sets, with a common goal of abstinence. They help more than 15 members on a weekly basis and are closely involved with local services such as Unity, CADAS, and The Well. Ged Pickersgill, Group Leader, said: “This grant has offered the chance of independence to our service users and reduced isolation by becoming a part of a weekly activity based group which encourages peer to peer support.